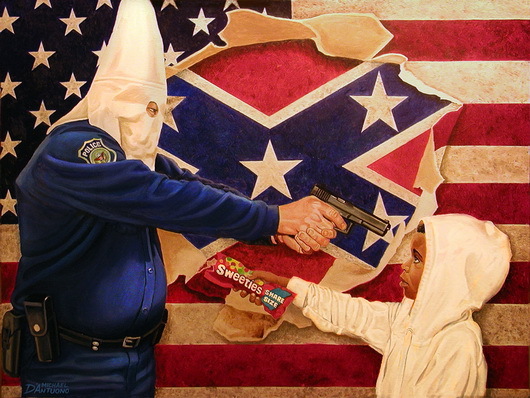 It portrays George Zimmerman as Caucasian, wearing a police uniform and a KKK hood, and pointing his firearm directly at Trayvon Martin’s head. It shows Trayvon Martin as being approximately four feet tall, ten years old, and offering the gun-brandishing Zimmerman a pack of Sweeties candy. Amazingly enough, D’Antuono actually intended for his painting to be considered legitimate social commentary regarding the Trayvon Martin shooting and racial profiling in America, rather than a satire of the media’s handling of the case as one might assume at this late date. This has been a recurring theme in the Trayvon Martin case. Some people are extremely desperate to make the case about race, primarily because it’s much easier to cry racist than it is do deal with the societal implications of a “typical teenager” like Trayvon deciding to play “the knockout game” on a neighborhood watch captain. The most striking thing about the painting is that even though nearly every aspect of the portrayal is obviously flawed, skewed, or just outright made up, the artist still tries to justify it by calling it symbolism of a larger societal issue. Again, it’s so extreme you would almost have to assume it’s self-parody, but D’Antuono is convinced that his artwork is not at all racist, but that any responses calling him out on the myriad of things wrong with it are. D’Antuono pretends a Hispanic man is Caucasian in order to make the painting more provocative. He compares a Hispanic performing ordinary neighborhood watch duties to him being a member of the KKK. D’Antuono ignores the fact that a Hispanic man was brutally attacked in his own neighborhood and was severely injured before the shooting took place. He directly changes the ethnicity of one of the two subjects in a painting that is specifically supposed to function as social commentary about racism, rendering any insightful analysis nearly impossible. He changes the height and weight of Trayvon Martin in order to make him appear as a helpless victim, rather than a 6’3, 160lb high school athlete who just broke someone’s nose and was bashing their head into a concrete sidewalk. D’Antuono stereotypes law enforcement officials as being fat, white, prejudiced murderers, even though there were no police involved in the shooting whatsoever. Why is D’Antuono so racist towards Hispanics that he feels the need to paint them up as KKK members? Is it a coincidence that there isn’t a single Hispanic featured in a positive light in any of D’Antuono’s other work? This shows how massively blinded D’Antuono is by sheer black-and-white thinking when discussing the Trayvon Martin shooting. He fully believes that anyone who disagrees with his fictitious, racist portrayal is not only mistaken, but that they must also be conservative politically, which is almost certainly a smear in his eyes. To D’Antuono, it’s a political issue. 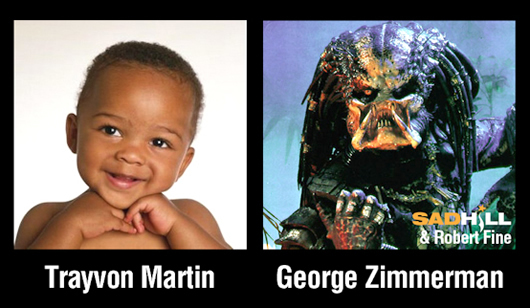 Any humanization of Zimmerman would conflict with his negative ideas about conservatism; that simply can’t happen. Even though the Trayvon Martin shooting case has very little to do with race and everything to do with self-defense, D’Antuono has changed nearly every fact associated with the shooting in order to make it appear as racially charged as possible, then has proceeded to name-call anyone who disagrees with his irresponsible portrayal. More and more, it seems like accusations of racism in the Trayvon Martin case are actually a bizarre form of psychological projection. The accusers actively make up their own reality in order to make the shooting fit their worldview, even when it has been shown that race mattered very little, if at all, when the actual evidence is examined objectively. D’Antuono’s painting has does much more to expose his own internalized prejudices and bigotry, and unfortunately offers very little of value to the arena of public discourse on the matter, beyond perhaps adding even more evidence of the continuing absurdity of how Zimmerman has been depicted.